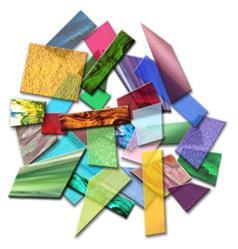 This special assortment contains cathedral glass in all colors, opalescent glass and some antique glass in scrap pieces resulting from damage in transit, from trimming to make special cut-to-size orders, and from other activities which occur in our warehouse. Some of the breakage is caused by evil spirits. This assortment is ideal for making the stepping stones and other outdoor projects which are so popular today. A good supply of this glass will enable you to fill in all of the nooks and crannies of each undertaking without having to cut up valuable sheets of pristine glass. Sizes usually range from 2" x 1" to 3" x 3", but some pieces are larger. We cannot and will not select for size, shape, color or various degrees of beauty, sincerity or other real or imagined attributes. This is an ideally economical mixture for Gluing-Type People, as well as Stepping Stone People, who can make good use of these smaller assortments to sharpen their skills before investing in the grandiose assortment #1906. In response to lots of requests (well, actually they were complaints) that it would be nice if folks could buy a small amount of scrap glass, we have put together this offer. Despite the headline, this offer is available to adults as well as minors.